Winter Crossings is part of the Winter Series E-Book. Winter Crossings starts from a Mosaic Stitch band and then moves into a complex body of Bavarian Travelling stitches to form a complex whole. The hat itself it almost a bucket style as the mosaic band does not pull in as a ribbing would. This a charted pattern with minimal written instructions. Charts are coloured to keep the reading easier. This a sampler style pattern. There are 9 different patterns and there are stitches moving on every row. 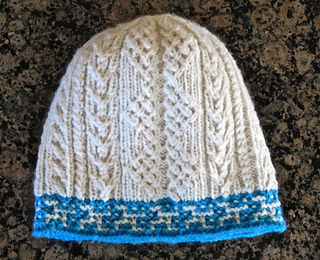 Mosaic Stitch Colour Work – a method of working a colour pattern without carrying colours across the back of the knitting. Each row of finished sts in a single colour takes two passes across the needle. The pattern can be worked in stockinet or garter st – our pieces have been worked in garter st.
Bavarian Travelling Stitches – a method of moving stitches across a background to create simple to complex patterns. Each movement involves crossing stitches; knits over knits or knits over purls, sometimes the stitch underneath will change status from either a purl to knit or a knit to a purl. All of the knit stitches are worked through the back of the loop to twist and tighten the stitch. This is necessary to create the tight, well defined patterns. There are three different methods of working the crossing stitches; all are explained and 2 do not require a cable hook. Because of the complexity of the patterning there is only one size offered. Sizing can be changed by using larger needles to create a looser gauge.